Mocktar, a Nigerian peasant, comes looking for work in Essakane, a dusty gold mine in Northeast Burkina Faso, Africa, where he hopes to forget the past that haunts him. In Essakane, he quickly finds out the gold rush ended twenty years before and the inhabitants of this wasteland and strange timelessness manage to exist simply from the force of habit. The beautiful Coumba, however, is still courageously struggling to raise her daughter after the death of her family. Mocktar will soon be fighting not only to survive, but also to provide a better future for this mother and her child. May Nyiri. 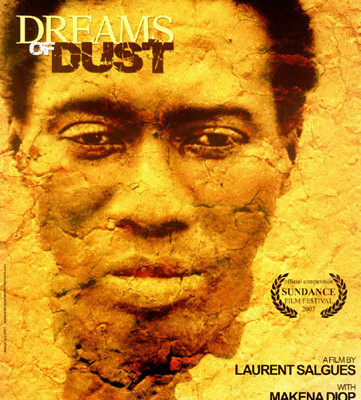 “Film Review: Dreams of Dust.” Kino Critics. Robert Beveridge. “Reves de Poussiere (Dreams of Dust)(2006): There’s Gold in Them There Hills.” Popcorn for Breakfast.